It’s that time of year again, when I go scrounging about the ‘hood like a raccoon, pawing through the early greens. A nearby hydro cut provides a goodly supply of violets and the purple ones are up in abundance. I brown bagged the flowers. Initially I planned to make a lemon cake glazed with violets mixed in warmed up maple syrup but after a weekend of cleaning up the gardens, making pastry and solar cookies, and the desire to make muffins that still lay ahead of me, I decided to ixnay the cake idea. 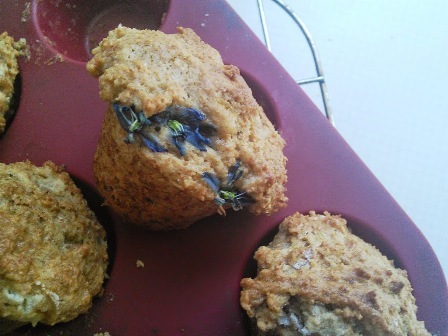 Since muffins are the baking equivalent of meatballs–you can put pretty much anything in either and they’ll still turn out okay–I decided to chuck the violets in them. Mix together 1/4 cup unsalted butter, 1/4 cup marmalade, 2-3 tbsp brown sugar, 2-3 tbsp plain yogurt, pinch o’ salt, 1/2 tsp ground ginger (or cinnamon/nutmeg) and 1/2 tbsp vinegar (or lemon/lime juice/apple cider vinegar). Mixture should be a little runny but not overly so. Add 1 cup whole wheat flour and 1/2 tsp baking soda. Mix until just combined. 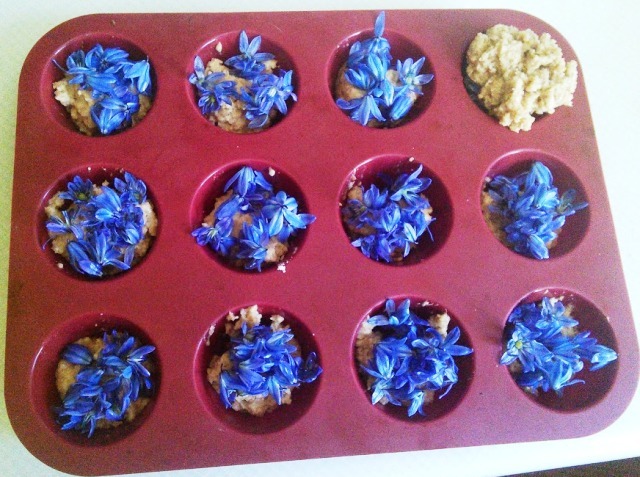 Fill muffin tins halfway only then sprinkle 5-10 violets on top of the batter, and cover with the rest. Bake at 375°F for about 15 minutes or so. 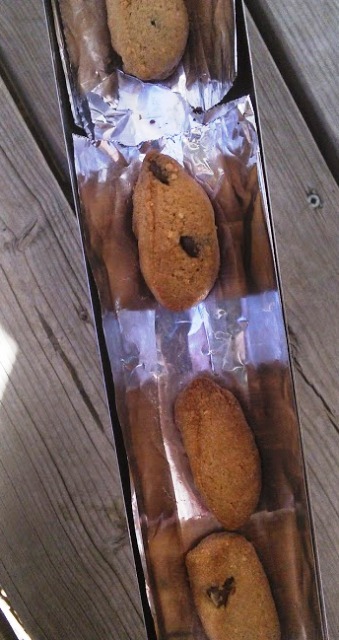 The recipe I used doesn’t matter; what matters is the surprisingly little amount of time it takes, even on a cool day to make a small batch of chocolate chip cookies using a solar cooker. Last Thanksgiving it took less than an hour to fully cook and brown a batch of turkey balls; I figured cookies would take no time. 1:16 p.m. The day is bright, sunny and 8°C. Only enough room in the tray for eight reasonably sized cookies; I shrug, line the tray with foil then balls of cookie dough and insert the tray into the cooker. 1:31 p.m. The batter has taken on that familiar oily sheen to it that cookie dough gets when it starts really warming up. 1:49 p.m. I step out onto the back porch to bask in the sunshine and there is steam emanating from the cooker. I pull out the tray to find the two cookies at the end are dark brown, almost overdone. I remove them, rearrange the remaining six, and put the tray back in. 1:54 p.m. I take the rest out and while they’re cooling down, I pop one of the still-warm overdone ones in my mouth. It’s crispy, it’s tasty, it’s delicious! So how did the violet muffins taste? Did the flowers give any flavour to them? The muffins tasted mostly of marmalade and ginger. I hadn’t been planning on cooking the flowers (they would have been warm but still raw had I used them as a glaze) so ultimately this became an experiment in what colour they’d turn.